There are so many festive experiences available these days from a simple meet and greet with Santa, to full day train excursions, activity days, and theme parks, that deciding which one to visit and where to spend your money in the hope of getting a good return can be really tough. So if you are currently looking at what is available, or are considering a visit to Winter Wonderland in Liverpool then read on to find out exactly what you get for your money. Liverpool is one of my favourite cities, mainly because it doesn’t matter how many times we go we always seem to discover something new and this week has been no exception. 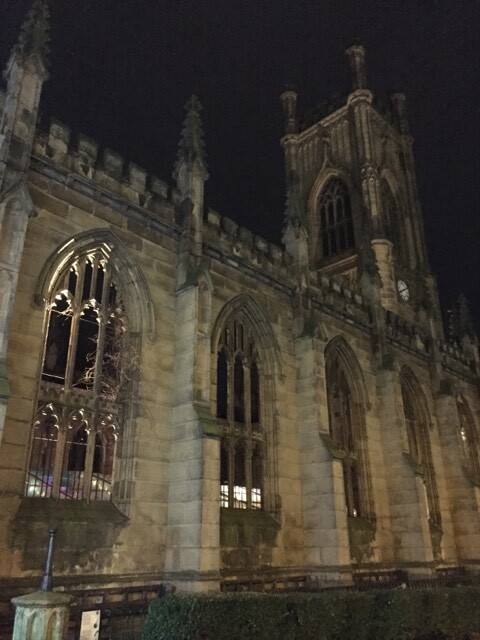 On Tuesday we were invited to experience the Winter Wonderland a St.Lukes church which you may already know as the “bombed out” church, something we haven’t done before and when we arrived I was blown away by the venue and realised that it was yet again a new Liverpool discovery for us and a very beautiful one at that. The bombed out church is a church ruin with glass less windows and foliage growing inside and is every bit a derelict church and on paper sounds like the last place you want to take children, yet it made for a beautiful venue for a winter wonderland. We were unsure what to expect having not been before but I did know that there was going to be a number of activities to join in with and having taken two kids on my own I was a little worried how I would split myself between them equally, ensure they both had fun doing the activities that interested them and stayed safe in a public space, but I needn’t have worried. 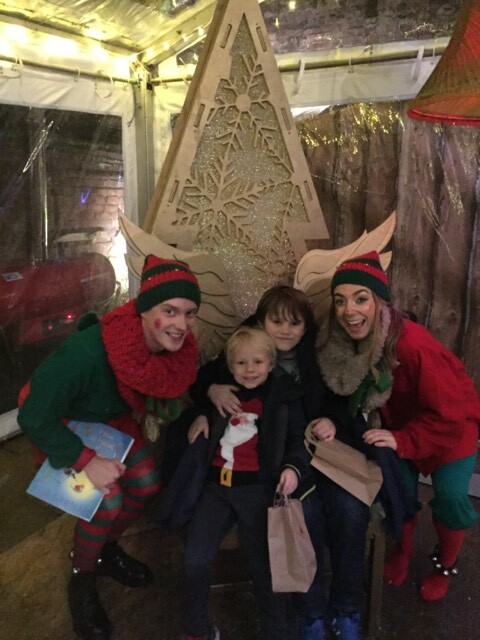 The way it works is that you are greeted by the head elf and taken to your first activity of Christmas crafting where Mrs Claus and a jolly little elf will help inspire your creativity. After a set amount of time the dong will ding and you will be invited to climb through the wardrobe ready for story time with a pair of very cheeky elves. These elves don’t just read you a story but get the children involved in creating one too, which was hilarious to listen to especially as ours soon went from the tame traditional tale to a weird and wonderful story as the children grew in confidence and allowed their imaginations to take over, resulting in father Christmas falling from a sky scraper and landing on a trampoline! Again this activity, like all of them, is timed, and once finished you move to a pair of playful elves that love nothing more than dressing up, dancing, and playing party games. 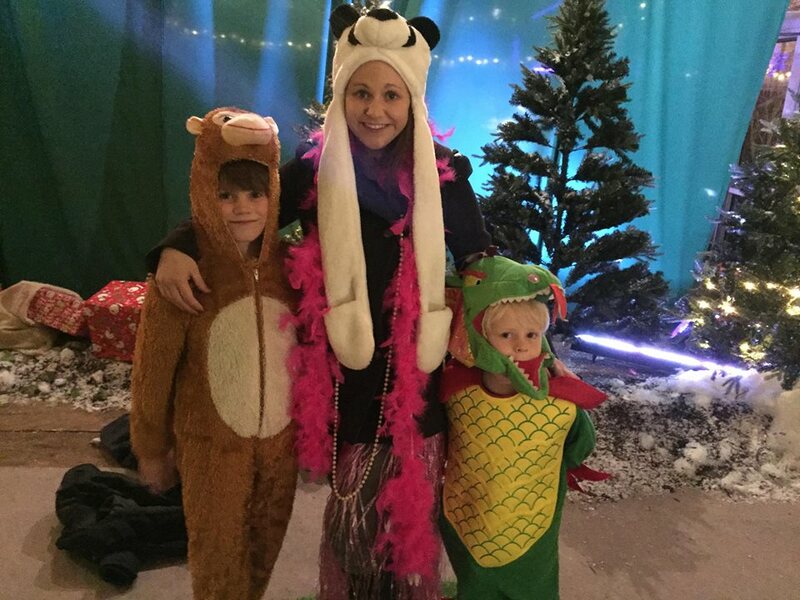 I can honestly say I have never been to a Christmas experience where I have worn a pink hula skirt, woolly hat, feather boa and a set of pearls and limbo’d with elves but as crazy as it sounds it was so much fun and my boys loved it. Still in your fabulous costumes you will then be moved to the next room for a silent disco. Thankfully the elves played songs with set dance moves like the cha cha slide and YMCA so my children couldn’t complain about my embarrassing moves too much, instead they joined in with us and even threw in the odd floss for good measure. 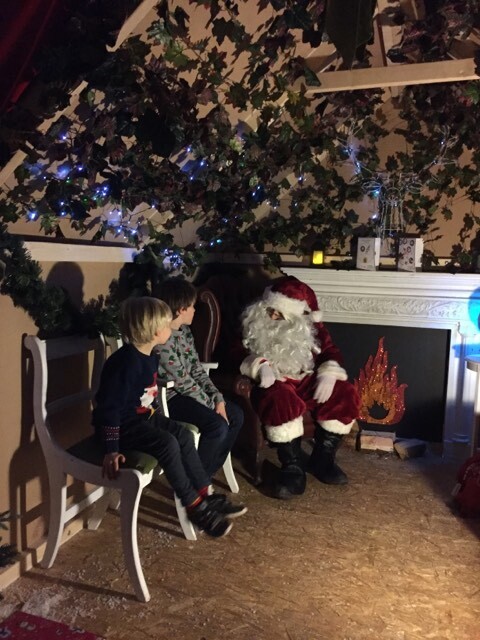 Once our dance off was complete it was time to meet the main man himself and I must say the grotto was beautifully decorated and made to look lovely and cosie, as if you were in Santa’s very own front room. The Santa was a delight, (although not the most realistic looking one), he sat and talked to the boys for a while and not once did we feel rushed. He also gave them a wrapped gift which I allowed them to open later and found they were Christmas books, which I think is so much nicer than a plastic toy or selection box and gave us something to do on the train on the way home. An extra surprise was that whilst the boys were with Santa they had their photo taken which was then printed off for us and made into a key ring, one for each child, at no additional cost which I think is a wonderful touch and something that can be cherished forever. We had the most magical time and both boys (6 and 8) thoroughly enjoyed themselves and I found that being encouraged to join in with the silliness made it all the more fun and memorable for them. If you are looking for a festive experience for you and your family then I would recommend that you consider Winter Wonderland in Liverpool. It will be running up until the 23rd December with each session lasting 1.5 to 2 hours and you can get a family ticket for £66. It is festive, engaging and exciting from start to finish and if you are looking for more than just a meet and greet this will definitely do it, especially for children between the ages of 4-8. (We were gifted tickets to this event in exchange for a review and all opinions are my own).